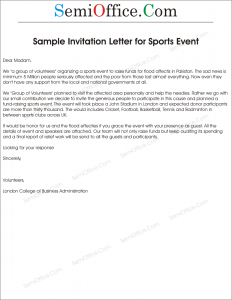 Sample Letter of Invitation for sports day in school, college, university or company available for free download. You can change the letters as per your needs but republishing of this material anywhere is strongly prohibited. Our school organizing Annual Sports Day in winter vocations this year. This event will involve almost all the students according to their interest. Event will include 20 different games, Bake sale, Music Competition and much more for entertainment. I would like to invite you in this greats Annual Sports Day event and request you to please charm the event with your presence. I will be thankful to you. This letter is to invite you to our annual sports event. Our annual sports event had been scheduled on 11th of the next month. It would be honor of our institute to have such a great personality like you as our guest for this event. It would also increase the motivation in the students. This event would be held within the institute premises from 11am to 5 pm. Please give us a chance to thank you for your presence at this event. 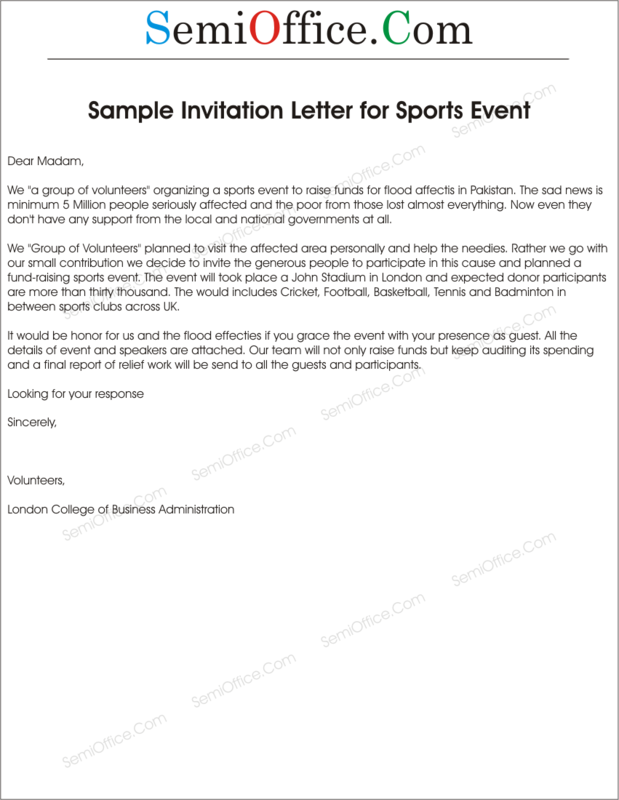 We “a group of volunteers” organizing a sports event to raise funds for flood affectis in Pakistan. The sad news is minimum 5 Million people seriously affected and the poors from those lost almost everything. Now even they don’t have any support from the local and national governments at all. We “Group of Volunteers” planned to visit the affected area personally and help the needies. Rather we go with our small contribution we decide to invite the generous people to participate in this cause and planned a fundraising sports event. The event will took place a John Stadium in London and expected donor participants are more than thirty thousand. The would includes Cricket, Football, Basketball, Tennis and Bedminton in between sports clubs across UK. It would be honor for us and the flood effecties if you grace the event with your presence as guest. All the details of event and speakers are attached. Our team will not only raise funds but keep auditing its spendings and a final report of relief work will be send to all the guests and participants.